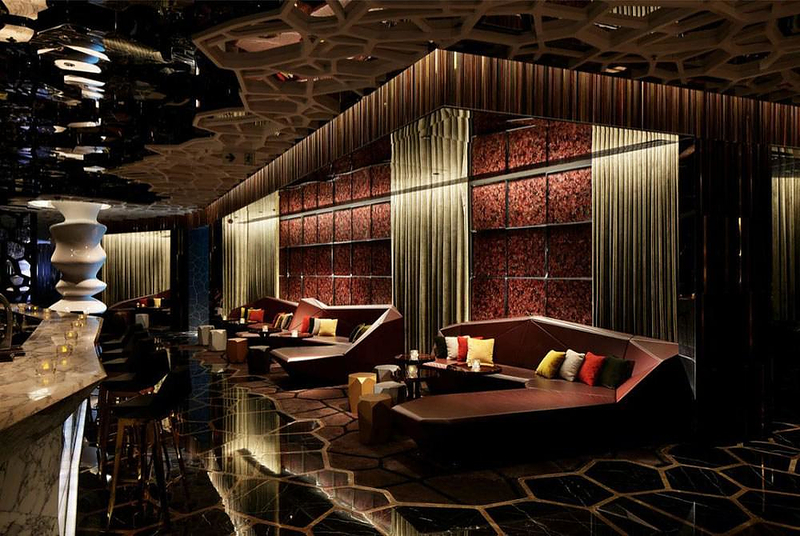 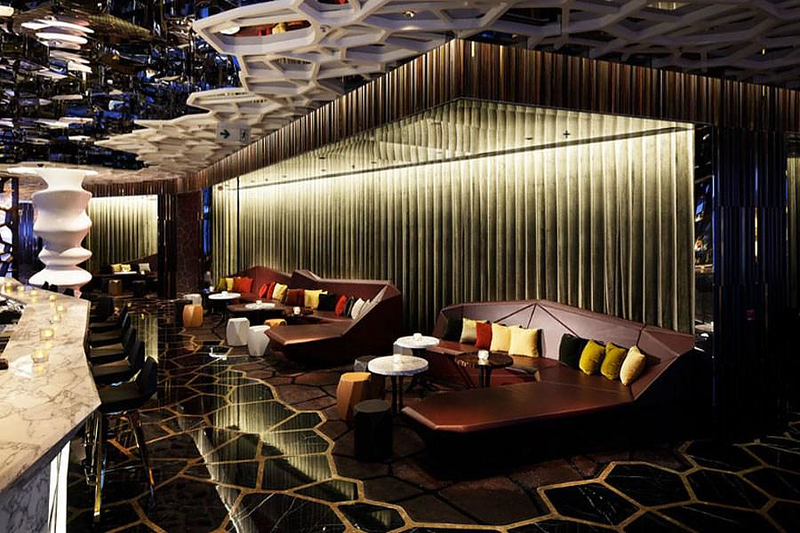 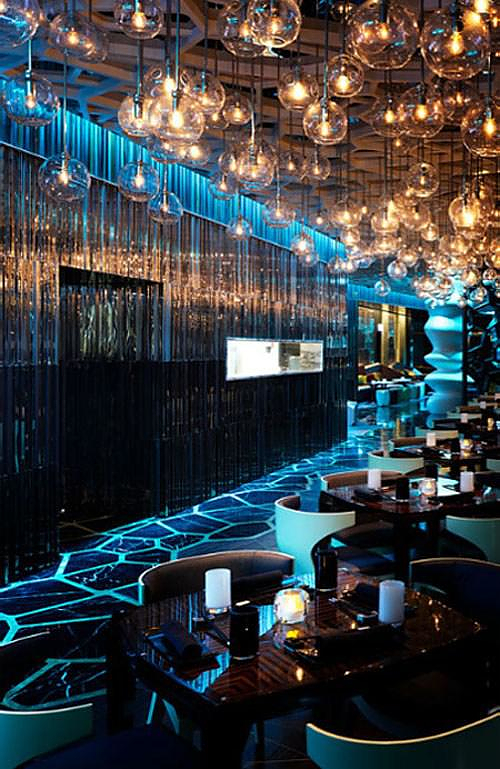 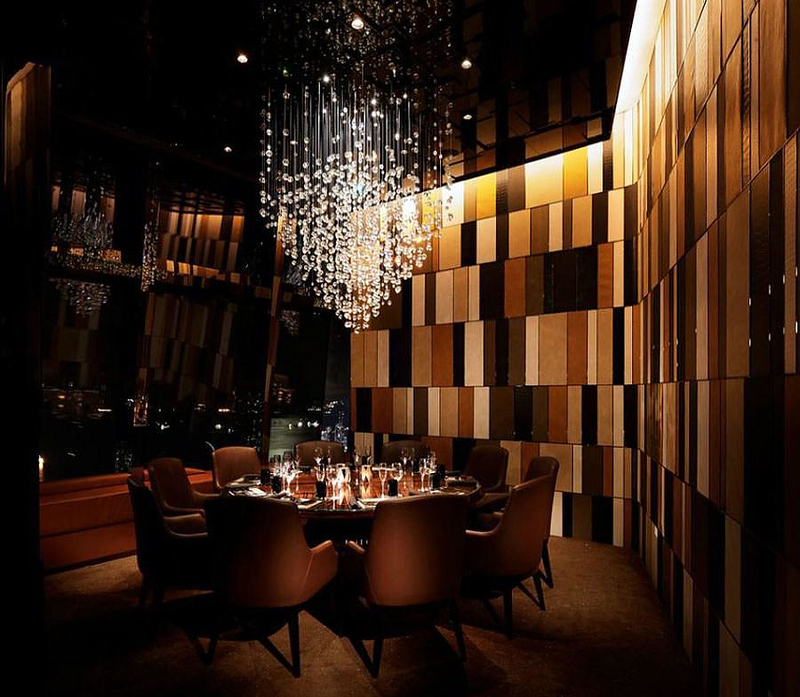 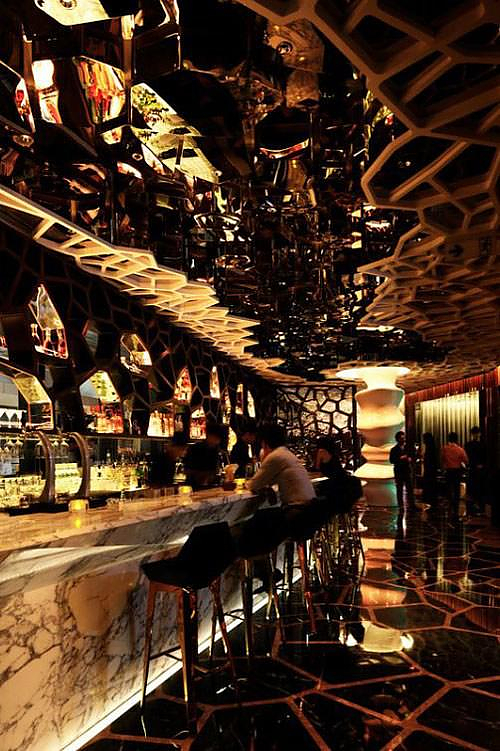 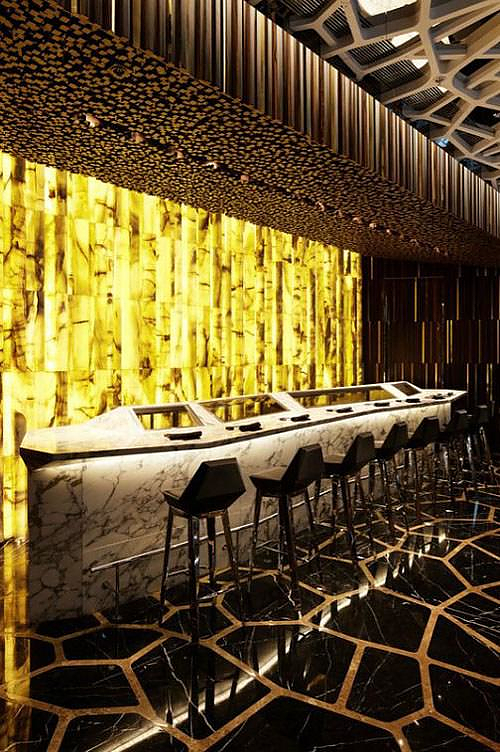 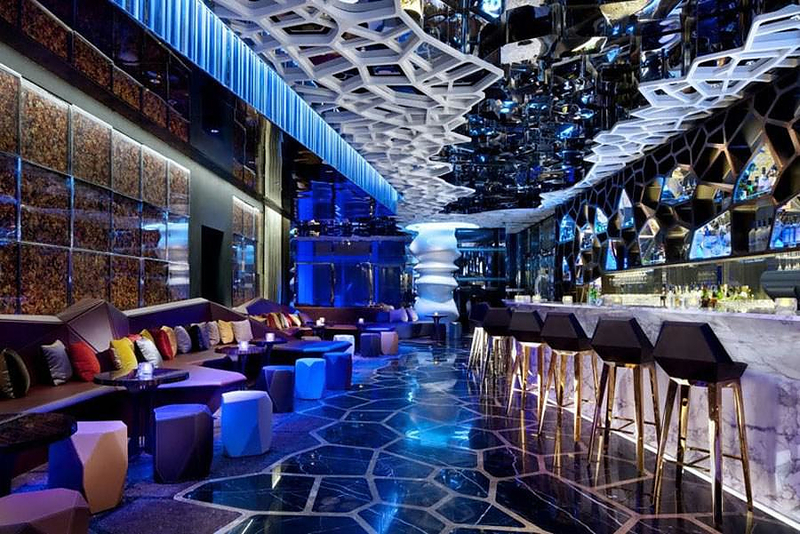 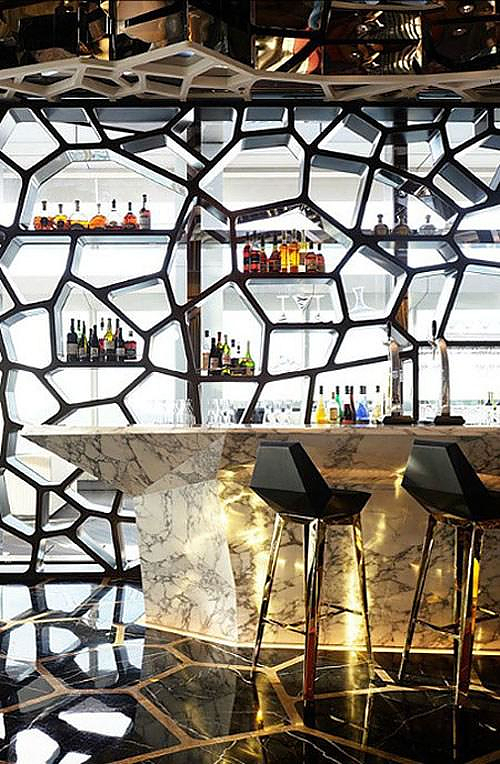 The spectacular Ozone Bar designed by Wonderwall is located on the top 118th floor of the Ritz-Carlton Hotel in Hong Kong and its majestic view complements the striking interior design. 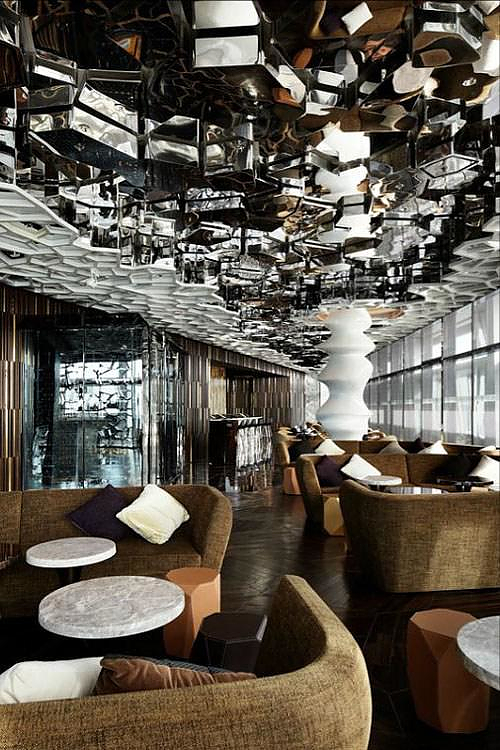 Japanese design studio Wonderwall is mostly known for their abstract, minimalist styling. 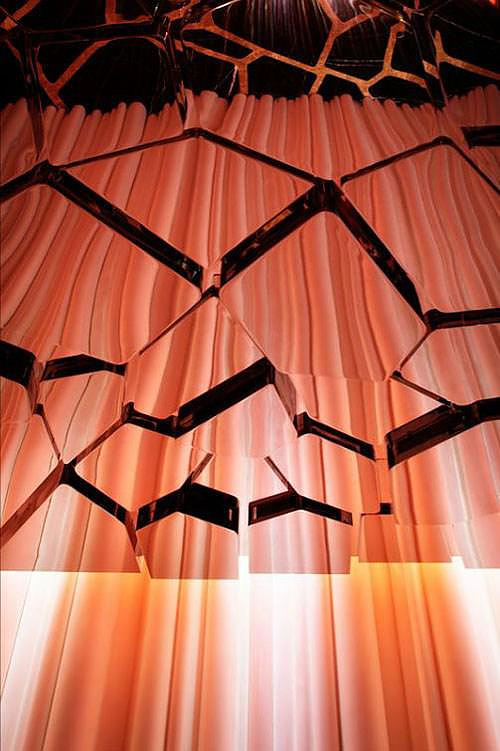 BAPE, FRED PERRY LAUREL and A.P.C retail stores are recognized examples of Wonderwall’s work. 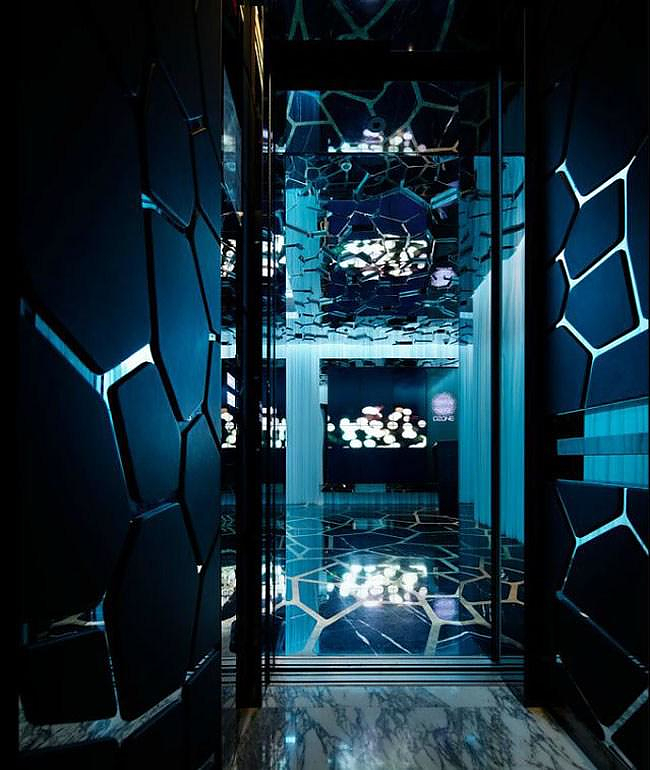 This time however Wonderwall’s founder, Masamichi Katayama strays from his signature style and creates an extremely complex space. 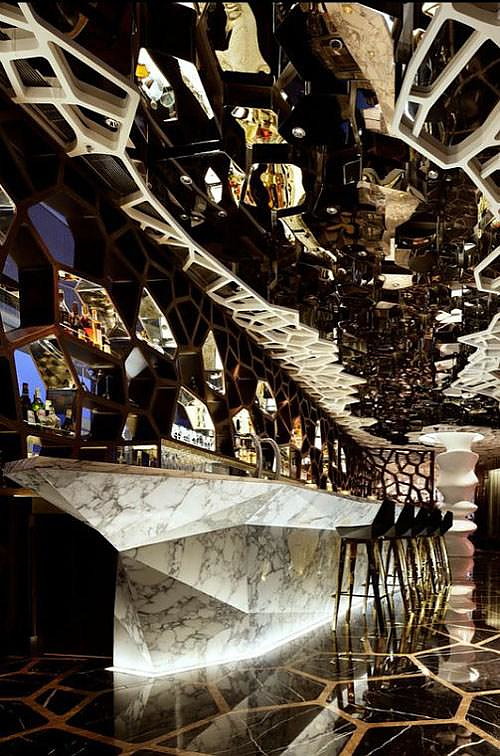 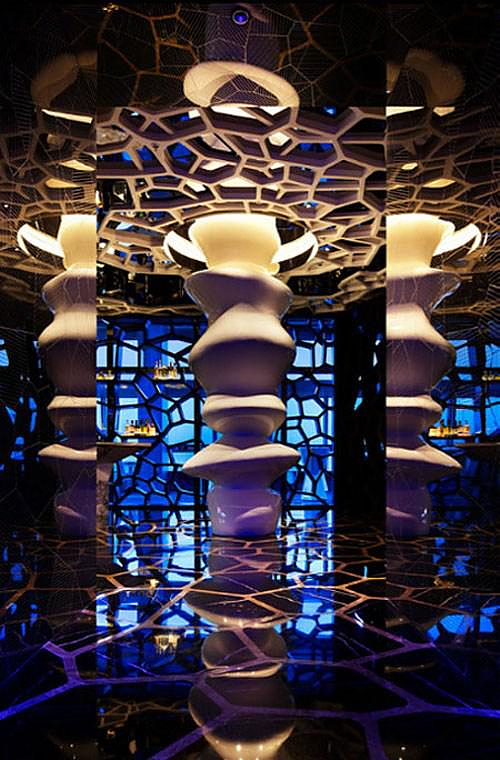 The Ozone Bar is architectural, bold, colorful, bizarre, and even a bit surreal. 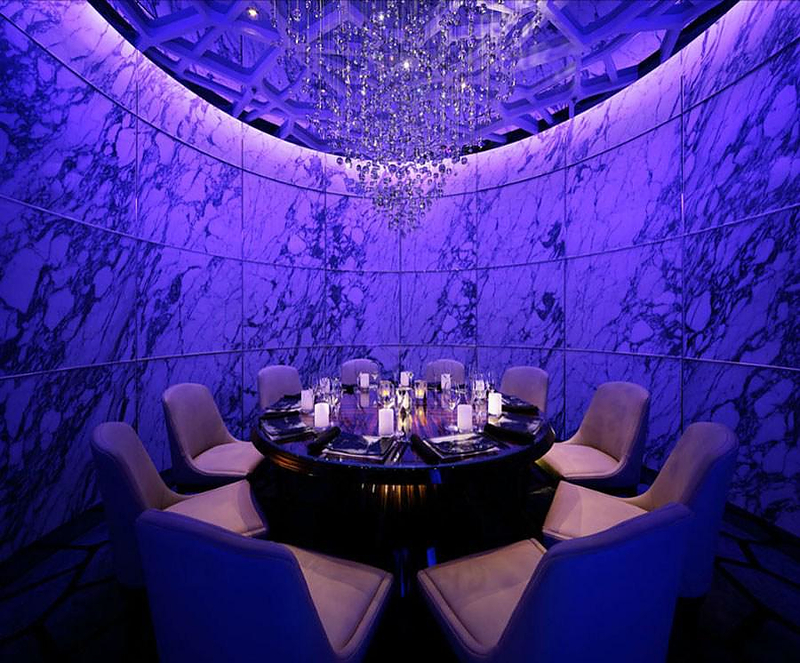 A remarkable and ultra-modern space infused with countless structural details that shape its own unmistakable identity……. 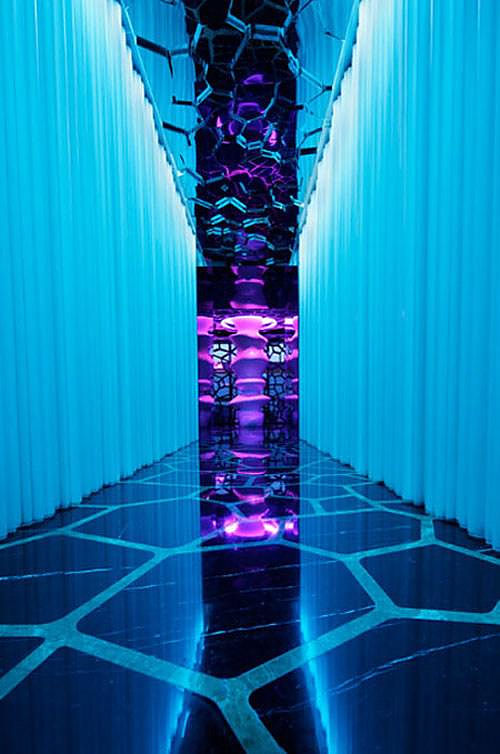 The whole project is designed around the theme of an “Edenic Experiment” – a man-made ideal environment, that could be part of nature in an imaginary world. 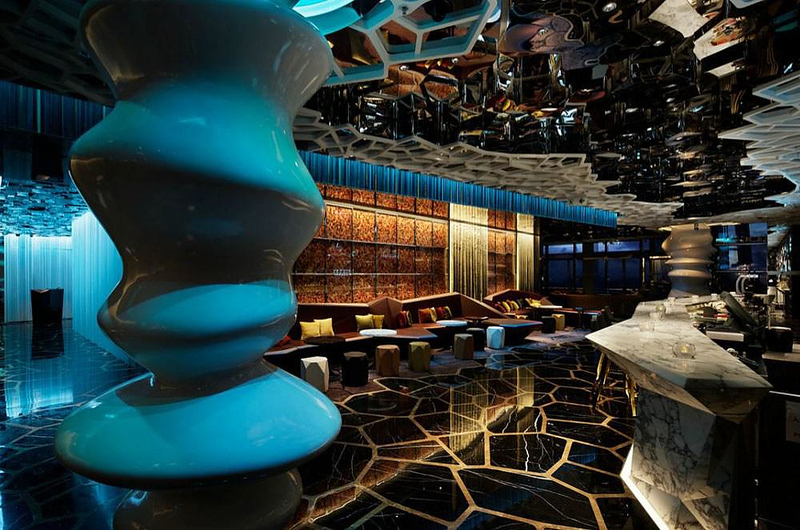 The materials used, the finishings, the lighting, the colors and the space planning, were very carefully considered in order to create a holistic concept of a proposed reality. 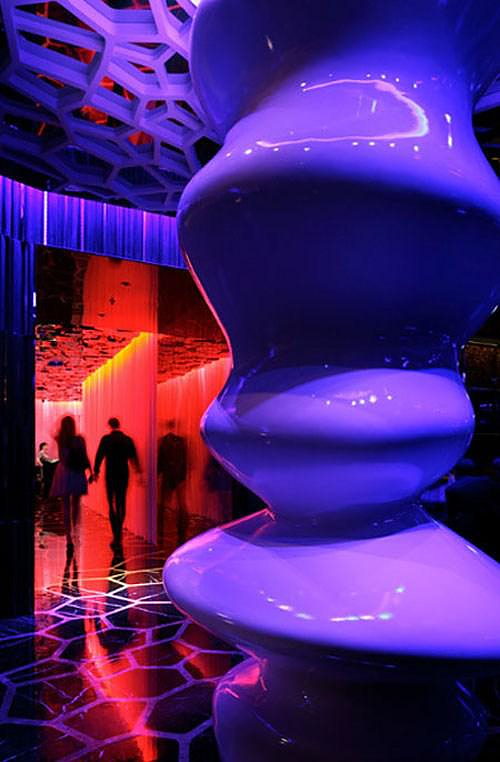 The experience starts immediately when the visitor enters the dramatic entrance. 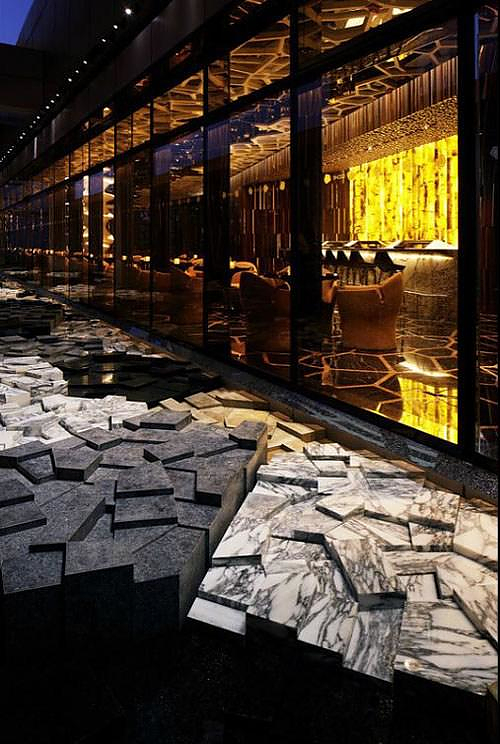 The intriguing granite floor tiles in conjunction with the theatrical, atmospheric lighting immediately predispose the guest for something out of the ordinary. 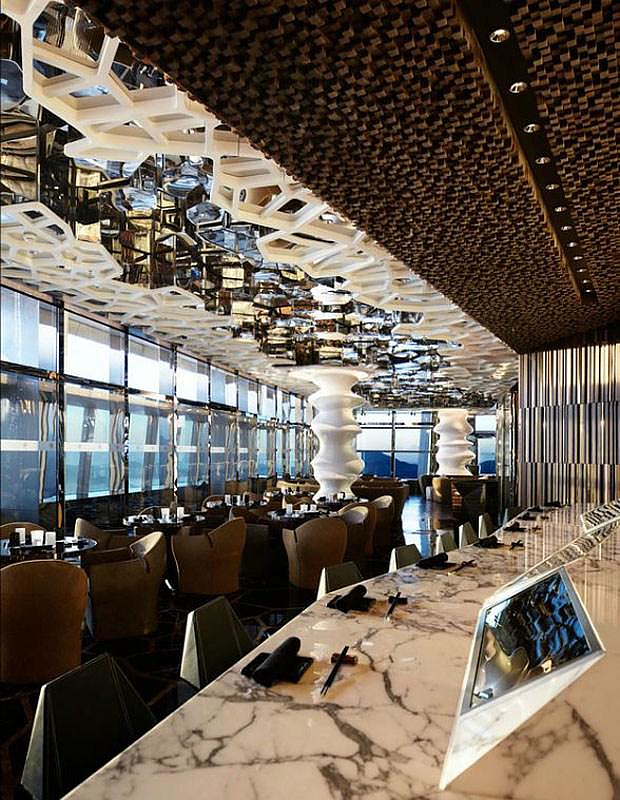 Everything around the place is harmonized to form a consistent inspiring, yet friendly feeling, from the bar, to the bar lounge, the lobby lounge, the dining room or the Tapas bar, everything just falls into place. 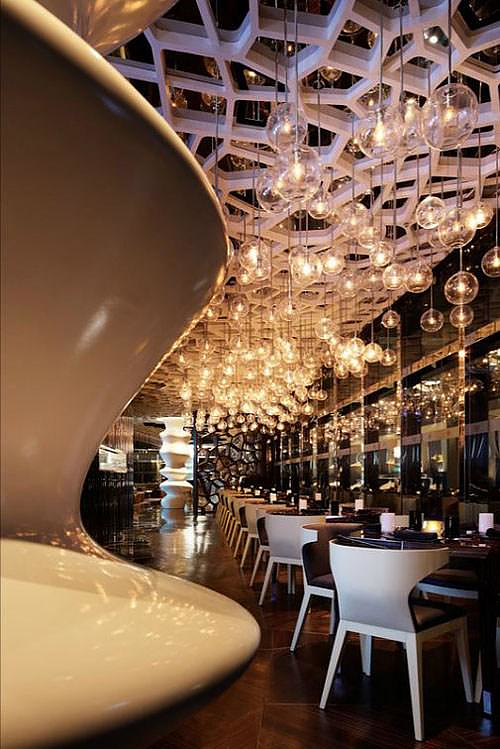 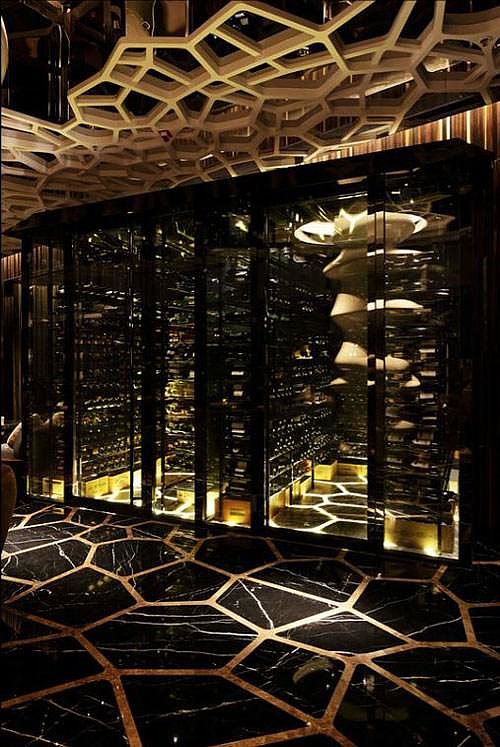 Moreover the exquisite details such as the intricate light systems, the innovative bottle-displaying shelves and the luxurious VIP tables, create a unique atmosphere. 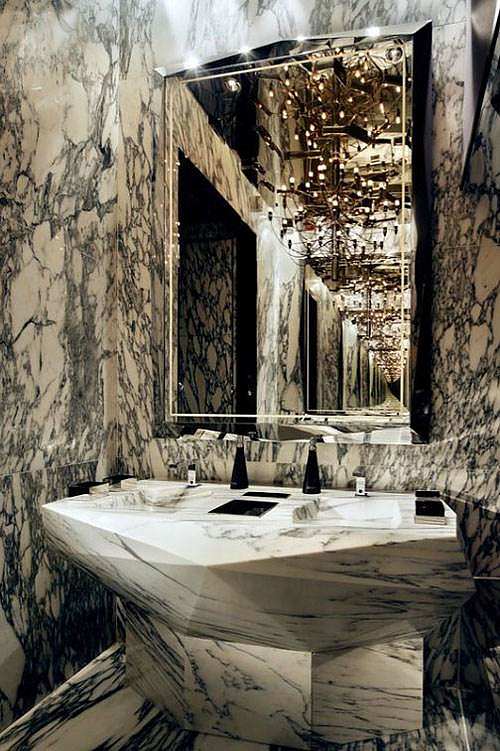 The immensely thought-out details are so many, that it would be impossible for a visitor to enter the palace (place we meant) ant not consume a certain amount of time to discuss and admire the décor. 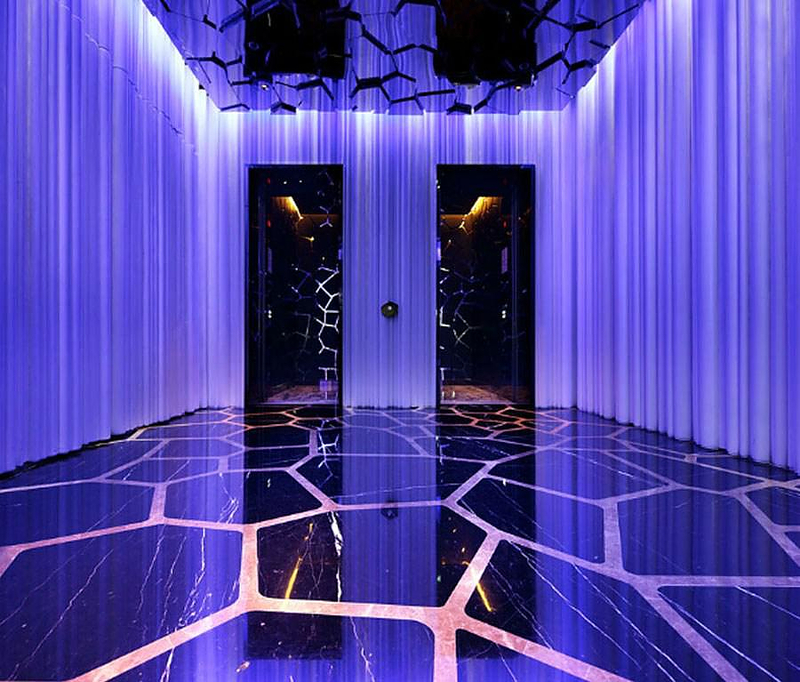 It is a magical place where one can spend some time in an environment where meanings such as: global recession, crisis, anxiety and uncertainty, don’t even exist. 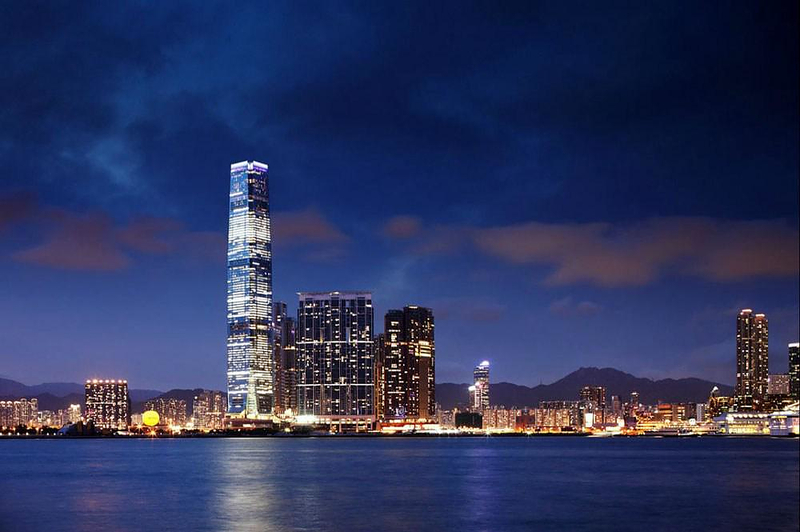 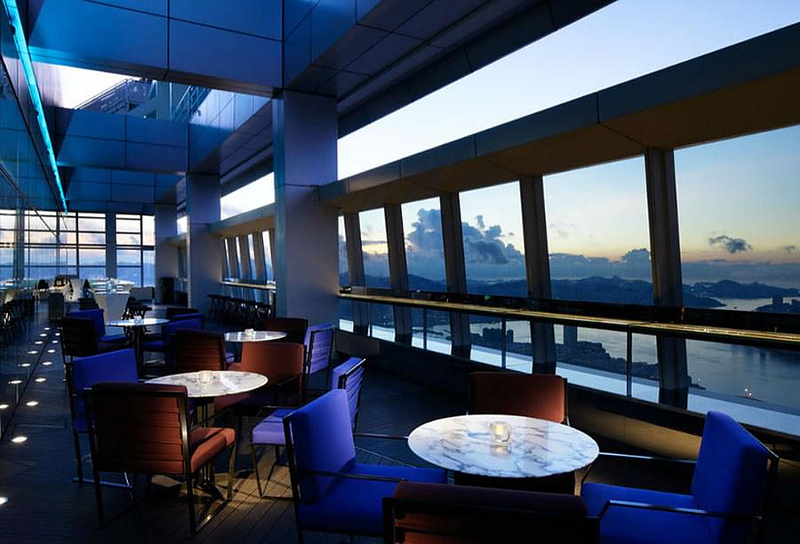 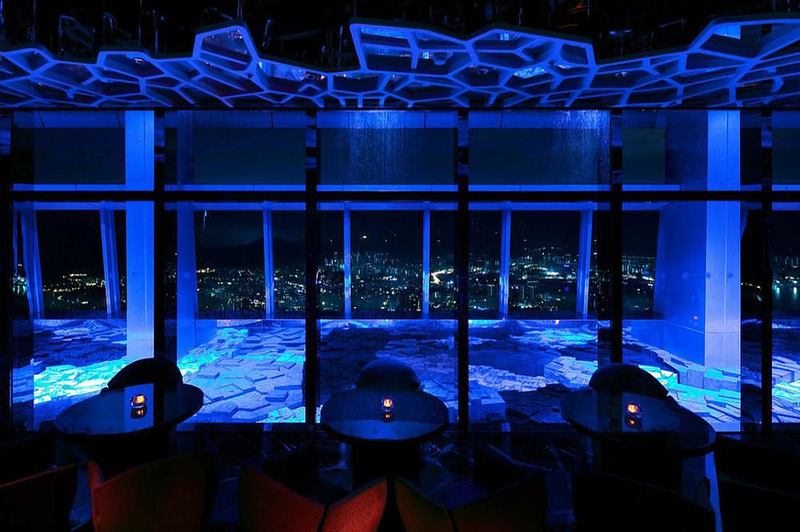 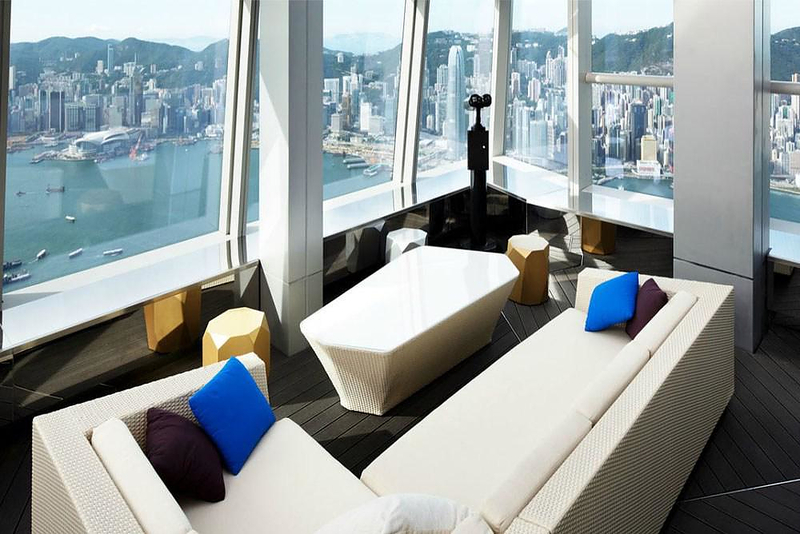 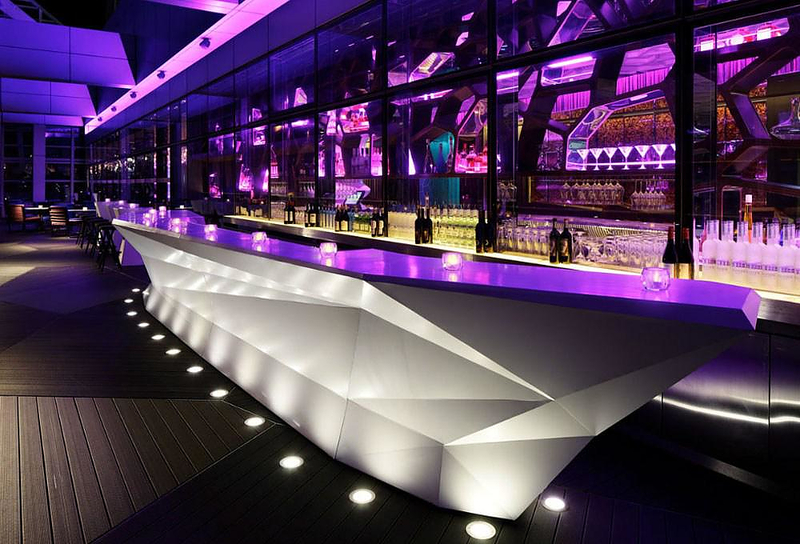 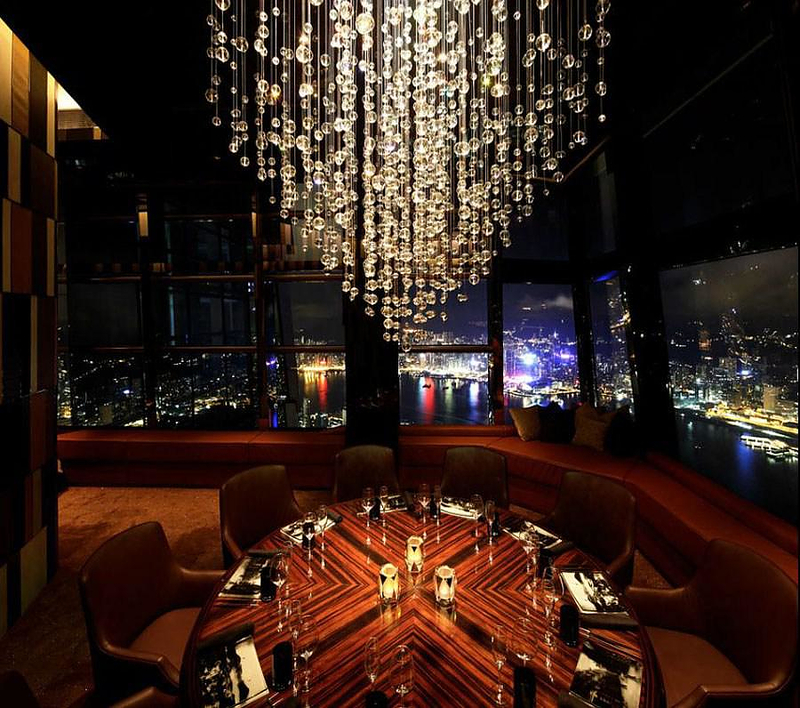 Hoisted far above Hong Kong the Ozone Bar by Wonderwall also offers superb view of the city and its natural beauty. 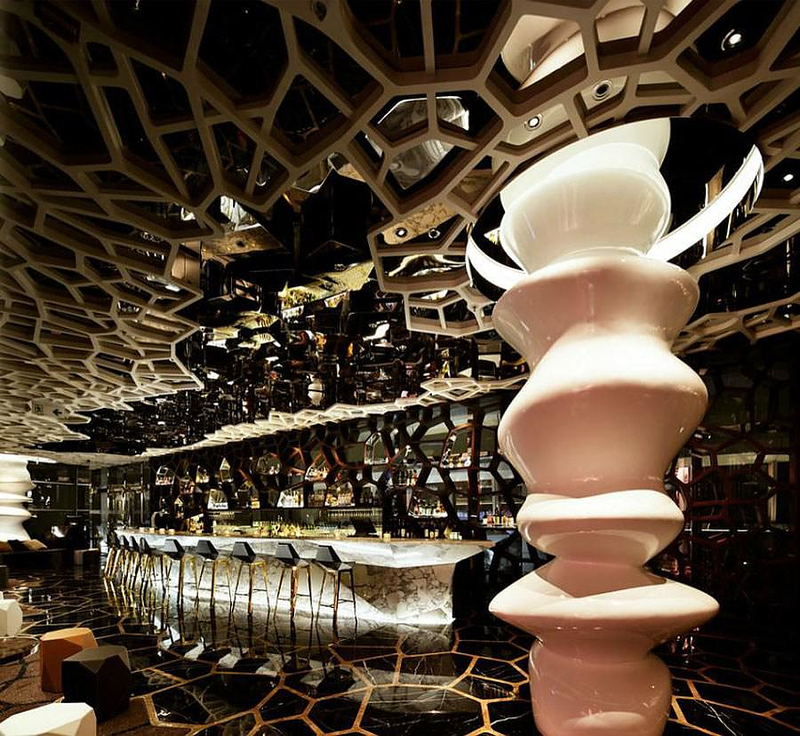 It is such an over-the-top design feat at such a magnificent location that the pictures can barely do it justice (at least we tried). 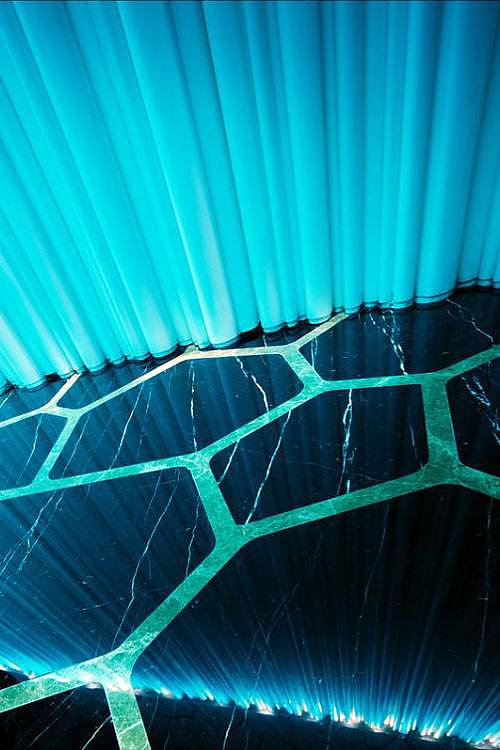 Sugamo Shinkin Bank by Emmanuelle Moureaux.